Over the years our indispensable guides have proved to be a huge success with walkers heading into the wonderful, varied countryside the UK has to offer. Our main range currently has ten titles covering The Yorkshire Dales, Lake District, Peak District, Snowdonia, Cotswolds, North York Moors and Northumberland. 20 or 25 outstanding circular walks, graded for suitability. Ordnance Survey or Harvey mapping. Handy durable, weather-proof walking cards. Walking card map case to to leave your hands free during the walk. To compliment the main range we also publish a childrens range of walking guides written and illustrated by Peak District primary school teacher Joanne Poyser, whose inspiration stems from her own love of walking. "I thought that if you could get children to feel in charge by making the walks easy and enjoyable to read, they would learn to love walking as much as I do." 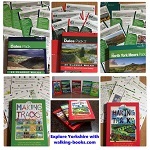 This unique series covers The Yorkshire Dales, North York Moors, Peak District and Lake District is, therefore, designed for children to take the lead with straightforward instructions and child-friendly maps. 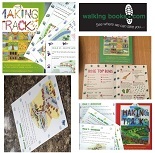 The "Making Tracks" Packs also appeals to schools organising outings and day trips and some third-age walkers who enjoy walking with their grandchildren, or simply like to undertake interesting walks at a more leisurely pace. Emphasis is on walking with fun and activity in mind. The eye-catching, brightly illustrated booklets provide all the information needed, and encourage children to look for things of interest along the way. The colourful collection is written and illustrated to appeal to children between the ages of five and 11. Has equal appeal to mature walkers interested in shorter walks of interest. Helpful advice on what children should wear and what to take with them. A wonderful set of books where we let the children lead the walks! 22 fun packed walks where the children learn about nature with projects to do before, during and after the walks. This is our latest walking guide and covers the wonderful Northumberland National Park. The pack includes 25 varied and inspiring walks to suit all abilities along with a handy user-guide and our unique map-case. 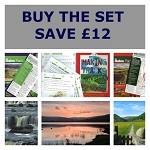 SAVE £10 with this SPECIAL OFFER that includes both the popular Dales Pack and it's equally successful follow up, The Dales Pack 2 - no better way to explore this walkers paradise! 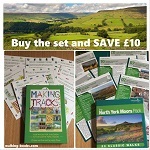 Two volumes that include FORTY of the best walks the Yorkshire Dales has to offer. The Lakeland Pack 2 is one of our favorite publications! This second volume of Lake District walks offers 25 inspiring walks to suit all abilities from throughout this walkers paradise. This unique walking guide offers 20 classic walks in and around the Peak District on individual, handy, weather-proof cards complete with OS mapping. The Ultimate Walking Companion to the Peak District. The Ultimate Walking Companion to the Peak District - a second volume of 20 classic walks on individual, handy, weather-proof cards with OS mapping. 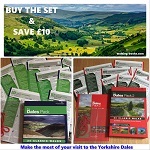 SAVE MONEY with this SPECIAL OFFER that includes BOTH the Peak District Pack and Peak District Pack 2 - no better way to explore FORTY of the best walks the Peak District has to offer. The Ultimate Walking Companion to Snowdonia - 20 classic walks on individual, handy, weather-proof cards with OS mapping.